The blueberries are finally ready for harvest! I feel as if we've been waiting for this all summer as we've patiently watched the bushes flower, then form small green berries, and slowly grow into plump purple clusters. We have been surprised at how many berries the bushes produced. They were planted just this spring, and although they were rather mature bushes, we didn't anticipate a very large crop until next year. We also have been happy to see that the deer have not been back after their early pre-harvest sampling! I had a talk with them after their raid a few weeks ago and apparently, they're standing by our compromise agreement (i.e. eat all the roses you'd like but leave the berries alone). Margaret joined me for the first harvest as Graham was still down for his morning nap. The berries we picked were to accompany our morning pancakes. Now that the babies are eating solids, we'll be sure to include some blueberries in their menu this week - which is so exciting! She liked squishing them between her fingers. These look great! And home grown! Those berries look divine! I love those precious little hands in the bowl, so cute! I've always wanted to plant blueberries. Hooray for you and I'm glad the deer left you alone!! Lovely pictures of your baby!! i'm just getting ready to bake a blueberry tart for dessert tonight! i did not grow the blueberries though. margaret is ADORABLE. i can't believe she didn't put those blueberries straight away into her mouth! beautiful photos. So sublime. Reminding me of my Idaho grandma's wild blackberries - we would eat them in a bowl with fresh milk. A summer slice of heaven. You bear beautiful babies and fruit too! Wow. How splendid to pick your own and enjoy with your little ones. Love your photos. I went blueberry picking in Oregon and loved it.....Love your blog! How wonderful! I grow and harvest blackcurrents and red currents, but I'd love to add blueberries to my small garden. Oh those dimples in those perfect little hands :) ! Gorgeous photos of the blueberries and Margaret. Can understand how long the wait for those delicious little berries to ripen seems. Don't you love their smoky blue skin? Gorgeous! And so delicious and nourishing. You are giving your babies such a great gift....fresh, homegrown food! Gorgeous photos! 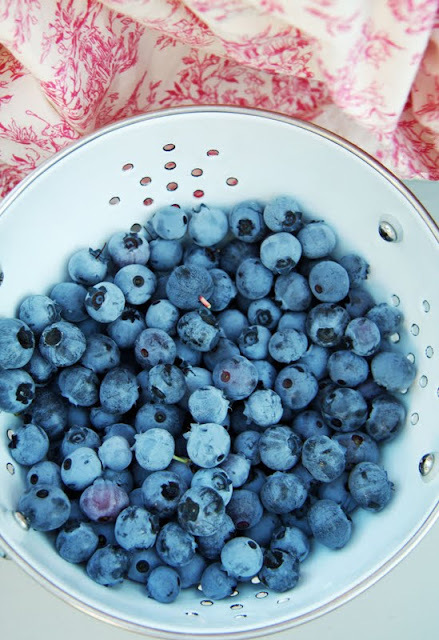 Love the vibrance of the blue berries with the white colander. We planted out blueberry bushes this summer... hopefully we'll get fruit next August! Delightful photos! I would love to see Margaret's little face after eating a few berries! They look yummy! 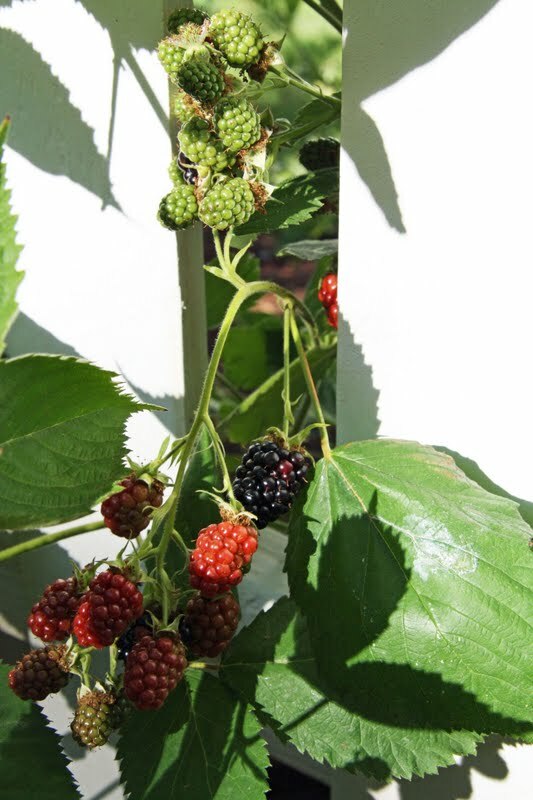 I can't wait to see your blackberry harvest - I love blackberries! omg... those precious little hands melt me. she is such a love! I miss ours already! Ours are done until next year (late June). Beautiful berries and what a sweetie you have there! Oh shucks, I wanted to be Follower # 3,000 but I'm only 2,999 :) Love love love your blog, off the top, and I want to come to your house and sit on that front porch, I want to watch the deer eat your berries, I want to watch your children play on the lawn, and (whew I'm worn out are you?) I want to walk through your gorgeous house oohing and aahing each step of the way. That's all. I'm going now to read some more and look at more pics of all the beauty. Oh.my.gosh. Those blueberries are AMAZING!!! True inspiration...I promise myself that next spring, I will try my hand at planting a few that will grow here. Your little one is sooo cute! Enjoy these times!!! so jealous of your blueberry plants and those little chubby fingers are adorable! Oh deer, you also have deer... Me too, in the Finnish archipelago. And they eat anything (as you know). Luckily they left the blueberry bushes untouched! They are delicious, although wild ones have better flavour. But it's wonderful to be able to harvest them in your own garden and to teach children how to grow and enjoy fresh food - a gift for life. 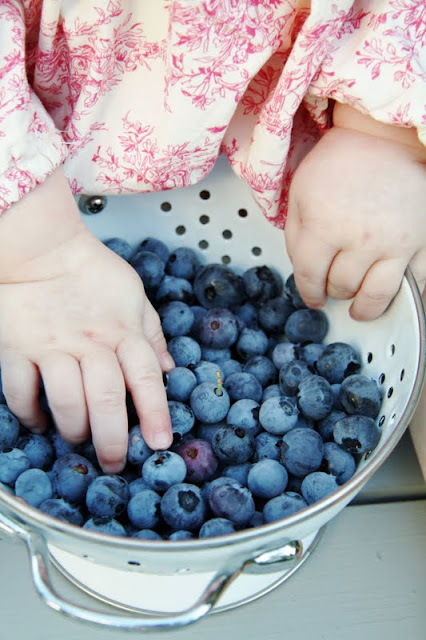 The blueberries look wonderful, but those darling little hands steal the show. Gorgeous, and what a sweet reward. I've been one of your silent readers for over a year now. I just couldn't resist becoming your 3000th follower. I expected bells and whistles to go off but instead, I've been quite appeased visiting with sweet Margaret and her blueberry "moment". Awwe...Margaret's little hand holding the blueberry was so touching...it reminded me of the pictures where Mike and you are holding something very special from nature's bounty, be it lady bugs or flowers, or fruits & veggies...it's just so sweet! Congratulations on your very first berry harvest...they look perfect, and even more so with Margaret enjoying them...the images are so pretty! they look so rich and plump. Love all the pictures:) I especially love the second one, because the leave on the right reminds of a bird sitting there:):) The ones of her little hands are so cute!! Great blog and post! Sweet little hands! Such stunning photos (as always! ), and such an absolutley gorgeous little girl you have there :) I would love to know where you bought her beautiful dress from, if you don't mind me asking? I haven't seen gorgeous baby clothes like that anywhere here in Australia! There's nothing quit as delicious as fresh blueberries...a part of my daily breakfast!! The dress is from the Gap and I bought it at baby consignment store. Lovely post ... I did one on blueberry picking too, but we had to drive quite far to get to them. How nice you have berries in your back yard! Margaret is precious, and the dress she is wearing is sweet. And those cute little hands! My great-nephew has loved blueberries from the time he started eating solid foods. I'll bet your little ones will develop a love of them too. 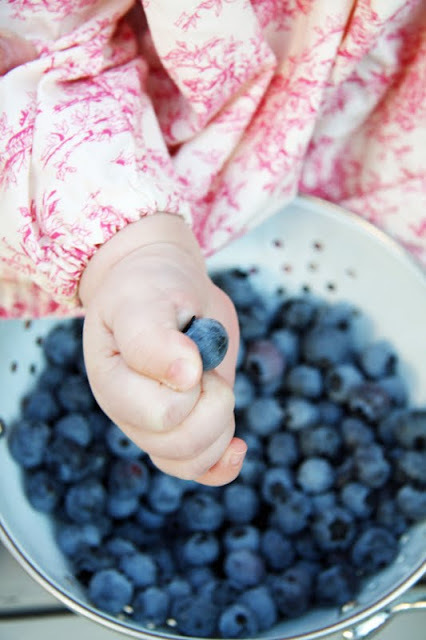 Love those squishy baby hands...squishing blueberries! Oh those chubby little hands are so sweet and that toile dress...you are killing me. I am in love! Fat little fingers clutching freshly picked blueberries -- precious combination. How much do you love your Ergo? I put one of my twins in ours yesterday and was very sad to discover that we are almost done with it -- they're nearly three now and barely fitting. Margaret, you sure are sweet! Stay away from the blackberries, though. Why is it that everytime I come over here I feel like I'm viewing the work of a high end home & garden magazine editor??? Everything you touch seems to turn to gold! Just stunning! Looks delicious....will have to put blueberries on the list of things to grow at the hut. What beautiful pictures!!! I am always amazed and find myself studying your photography. You nail the white balance everytime! You inspire me! And sweet Margaret's tiny hands...so precious! the blue berries look yummy, thanks for sharing. You're so ingenuitive! Where do you find the time? Gorgeous photos and a gorgeous little girl. How lovely to have your own fruit crops. My nephew and neice just bought a 104 acre farm, the 4 acres are wild blueberries, but in a part of Ontario with lots of bears. We have bushes in our yard that are over 50 years old and still going strong. Oh wow.. look at all those berries. My mouth is watering. Just love baby hands! Compare next year to see the growth and without a doubt it will be amazing! The blueberries look delicious , can't blame the deer for wanting the nibbles! 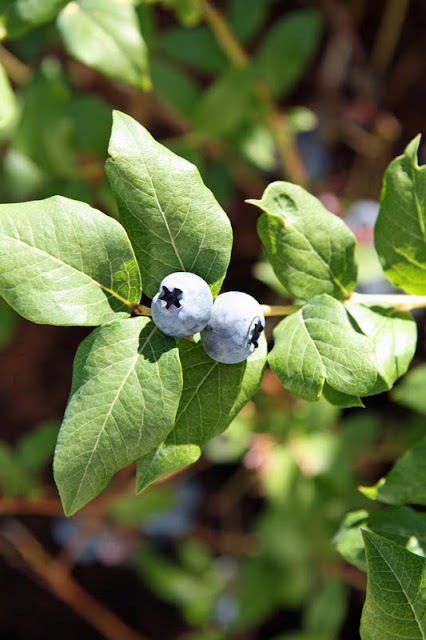 It's recommended that you get different varieties of blueberry bushes for cross-pollination. Happy blueberry season to you! what a sweet little baby! 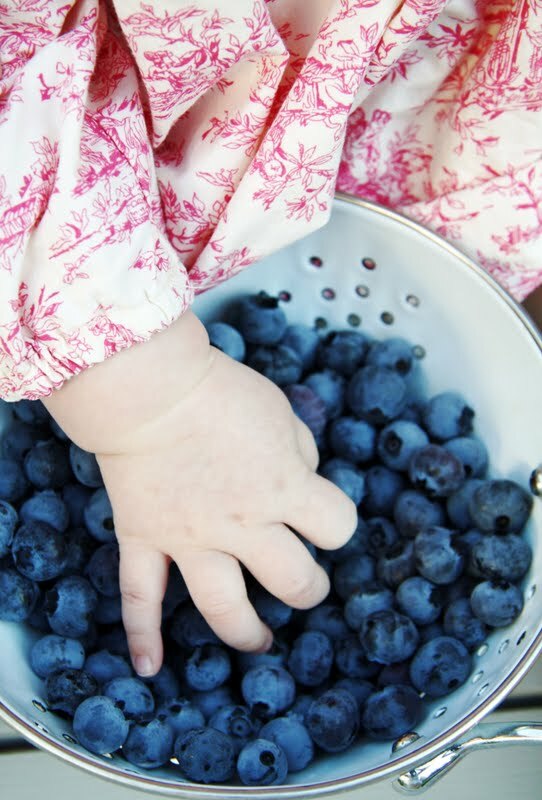 seeing her precious little hands in the blueberries is just heavenly... what a joyous day!